Laura Ramsey (known as @OracleDBDev on Twitter), recorded me a session about how it feels to be a DEVVY (#ODevChoice) judge. To be honest, it is really hard to be a judge. You need to check every detail, you need to be very careful when you are voting for the finalists. Also, it is so great to see the outcome. 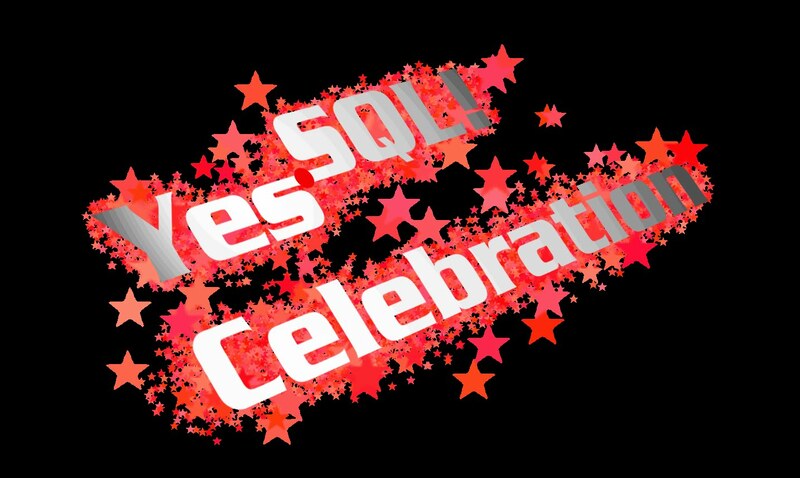 It is an honour to be the nominator of Emrah Mete (his LinkedIn and Twitter accounts), who is one of the DEVVY winner in SQL category. And he had the most votes of all the categories and clear the leader in SQL category. Thanks to all community members of TROUG and everybody who voted. 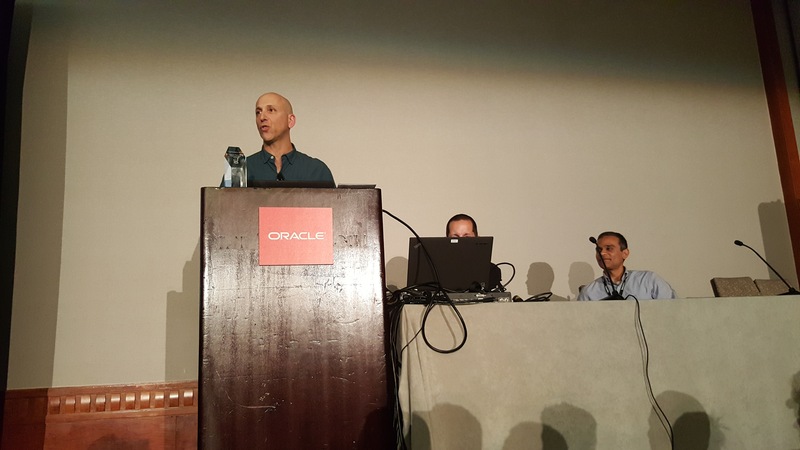 During the Oracle Open World 2015, Bob Rhubart (OTNArchBeat) recorded me a #2MTT (2 minute tech tip) and I talked about the “secret sauce” how to migrate from OWB (Oracle Warehouse Builder) to ODI (Oracle Data Integrator). To see the slides click my SlideShare account. It was my pleasure to nominate you and seeing the result honoured me more. 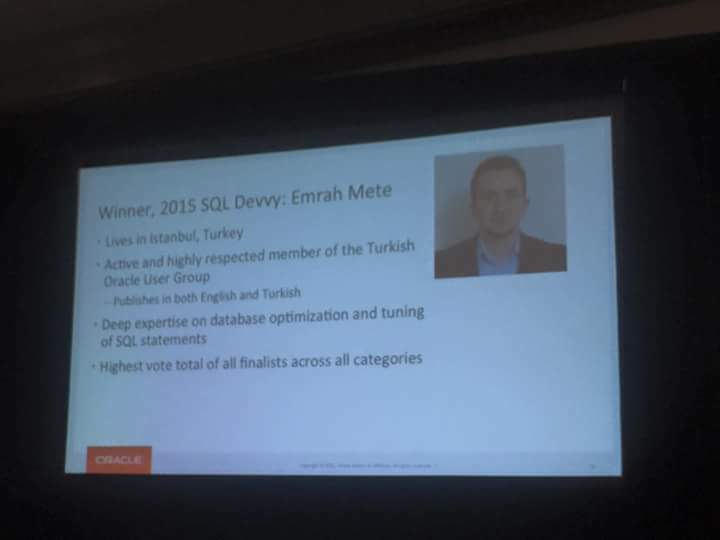 I nominated for Oracle Database Developement Choice Awards from Turkey approximately five months ago. 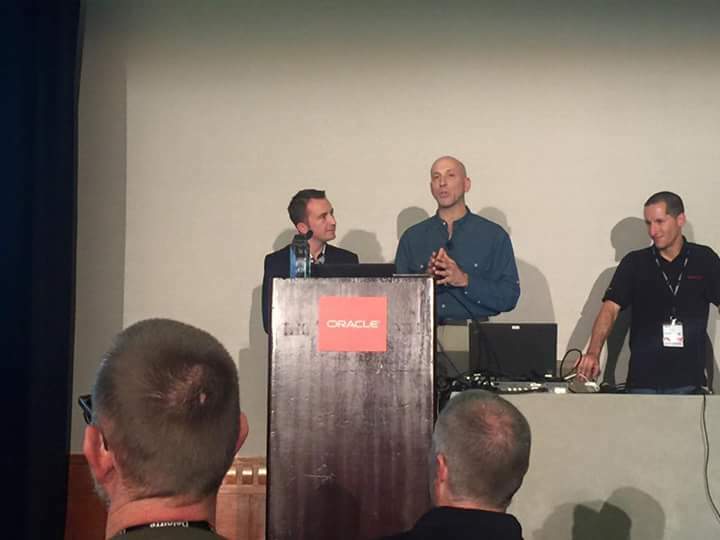 Then I learnt to be a finalist from Oracle Technology Network on 15th October. Then voting started to determine winners for each category. I finished voting at first place thanks to Turkish community supports. 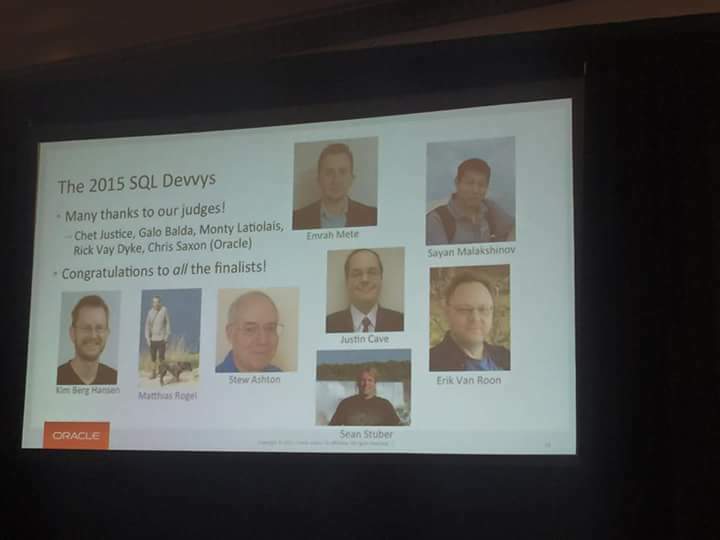 Winners were announced by Oracle at San Francisco (Oracle Open World 2015, YesSQLCelebration) last week. 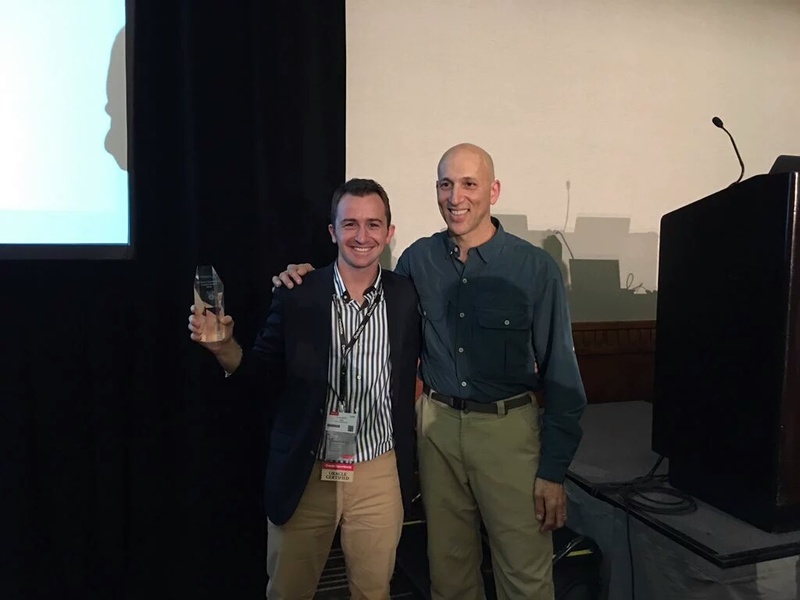 I was to be there and I took this award from Steven Feuerstein and Andy Mendelsohn(Executive Vice President @Oracle). 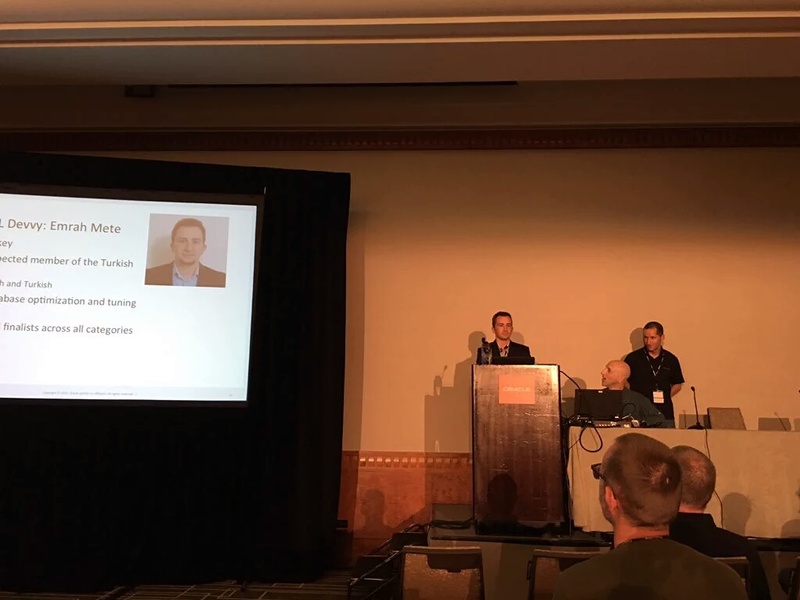 As I said in Awards ceremony in San Francisco, I am so honered to be a winners and I would like to express my gratitude to all communities who supports me (Especially TROUG ve TurkeyJUG). Hopefully, more awards like this come to our country and we may have the chance to show our capabilities all aorund the world.